Hi friends! I’m Leanne from Organize and Decorate Everything. Thanks for letting me share a fun kids craft with you today. I blog about organizing, decorating, crafts, DIY, recipes and more. I have 8 kids, with 3 kids still at home and 9 grand kids. My life is crazy busy and beautiful at the same time. I wouldn’t have it any other way. Creating, documenting, and displaying memories is our favorite thing to do. We enjoy spending time together as a family and choose to spend our money on family trips and small weekend adventures. It’s been fun creating lasting memories with our children who still talk about the adventures years later. Sometimes I have a hard time getting photos off the camera and displaying them though. Since kids love seeing photos of themselves I thought it would be fun for them to create a way to display them. 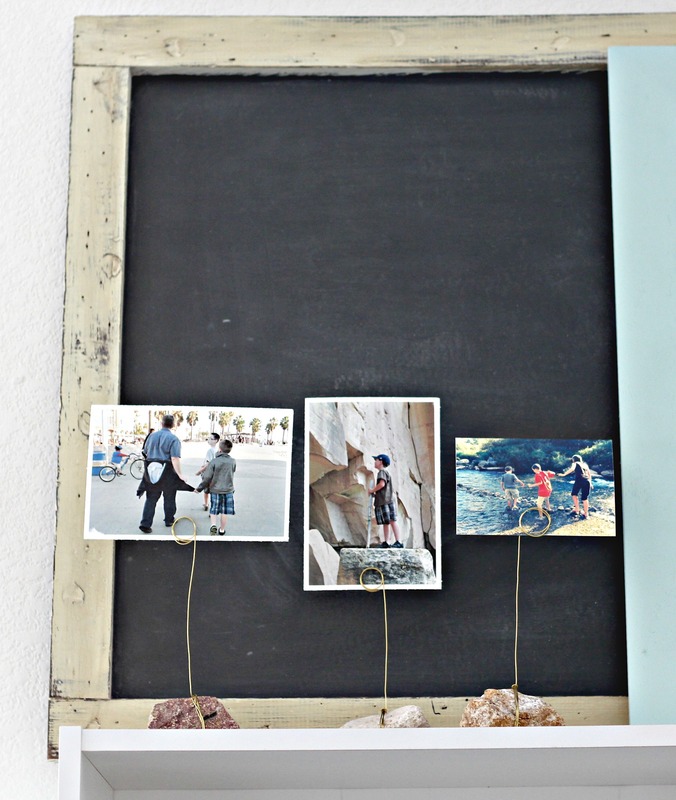 These Rock Photo Holders are fun and easy for the kids to make and then they can pick the photos to display on them. You only need a few simple supplies and once you cut the wire the kids can make them on their own. We live in the desert and don’t have pretty river rocks in our area. I would prefer those rocks but use what you have available. Since kids love collecting rocks, have them go on a hunt to find their favorites. You can choose any color of wire you like or use what you have available like I did. You will also need small wire cutters. Start by wrapping a long length of wire around the rock a few times, then wrap the wire once or twice around itself and pull it up to form the spiral on top. Don’t cut the wire until after you have wrapped it around the rock and decided how long you want the stem to be. Make sure to also have enough wire for the spiral on top. Use something round to help you form the spiral. This fat brush worked well. Go around 3 times for the spiral. If you have extra wire, cut it at the bottom of the circle. They’re fun and easy for the kids to make and it’s fun to see the different rocks they choose. Now it’s time for the best part, picking out the photos you want to print out and display. These will give me a reason to print out photos instead of keeping them on the computer. I placed them on top of the bookcases next to a map, but I think we’re going to make more to go in the boy’s room so we can display their favorite photos in there. It’s a great activity for kids to work on after a vacation or family outing by having the kids pick the photos they want to display on their rock holders. I hope you enjoyed this little project. If you’d like to see more you can visit me on my blog at Organize and Decorate Everything or follow me on facebook, instagram, pinterest, or twitter for even more fun ideas.